RAM Trucks is a brand of pickup trucks that are designed and manufactured by Chrysler Group LLC. The Detroit auto manufacturer used to produce RAM pickup trucks under the company’s Dodge brand of vehicles. Dodge started selling pickup trucks with the Ram name in 1981, but Chrysler decided to spin off RAM into a separate brand, as part of its post-bailout corporate restructuring and Chrysler’s acquisition by the Italian auto manufacturer Fiat. This move allowed RAM Trucks to establish a distinct brand identity while retaining the reputation the vehicles had already earned. And, the move freed the Dodge brand to focus on other passenger vehicles, such as cars and sport utility vehicles. For the 2014 model year, Chrysler added a lineup of cargo vans to the RAM brand. The RAM ProMaster line, a cargo van of Italian design, is available thanks to Chrysler’s ability to share resources with Fiat, as the ProMaster was initially designed for the European market and is known in Europe as the Fiat Ducato. The ProMaster cargo van lineup is a much needed addition to the Chrysler portfolio, after the Dodge brand lost access to the Mercedes-Benz Sprinter van. The Mercedes Sprinter is now the RAM ProMaster’s most immediate competition, along with the Nissan NV. The RAM ProMaster van lineup, including the ProMaster 1500, is assembled in Mexico. Chrysler introduced the RAM ProMaster lineup at the Chicago Auto Show in February of 2013. Several different models of the ProMaster are available to suit the needs of different work applications. The ProMaster features a front-wheel-drive layout that is efficient because it does not compromise the van’s cargo space, whereas a rear-wheel-drive or all-wheel-drive setup requires sculpting the van’s floor around the necessary components. The RAM ProMaster line also used partial unibody construction to improve efficiency. Like most cargo vans of European design, the body is about a foot and a half taller than an American designed van, which allows plenty of extra interior volume and allows people to walk around inside. The RAM ProMaster 1500 also offers a low roof option, though. A high-up seating position allows the driver to have a good view, and a relatively front flat end enables visibility and maneuverability. The RAM ProMaster is offered in an 118-inch wheelbase version as well as a 136-inch wheelbase version. 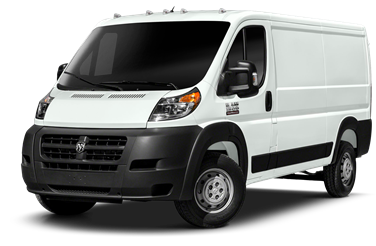 The RAM ProMaster 1500 is powered by a 3.6-liter V6 gasoline engine that yields 280 horsepower, mated to a six-speed automatic transition. The optional diesel drivetrain is another nod to the ProMaster’s European heritage; it’s a 3-liter four-cylinder turbo diesel that produces 174 horsepower, and gets a six-speed automatic manual transmission. The diesel provides better fuel economy as well as more torque for improved towing, but the gasoline engine provides faster acceleration. The RAM ProMaster can haul up to 4,417 pounds and can tow up to 5,100 pounds, depending on the drivetrain choice as well as the van’s configuration. RAM ProMaster vans feature standard equipment such as 16-inch steel wheels, cloth bucket seats, power accessories, keyless entry, climate control, and a four-speaker audio system with USB integration. Buyers can upgrade with options such as alloy wheels, a cargo partition, heated seats, cruise control, upgraded audio with Bluetooth wireless integration, a cargo accessory package, and an exterior appearance package.